An intranet is more than a project or a piece of technology; it’s a mission-critical business system and a significant investment that requires proper planning. Prescient has a five-phased approach or methodology that our consultants use to plan and design highly effective intranets, and digital workplaces. 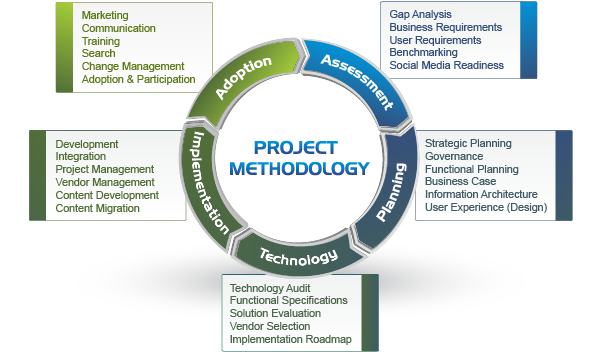 The first phase of this methodology is the Assessment phase, where the business and functional requirements of the intranet is determined and documented. Despite the traditional focus on technology and integration, the most critical phases are the initial ones: Assessment and Planning. At the heart of an intranet's success is the strength of the plan that governs it, and a successful plan begins with an intranet audit. Before undertaking any redesign or build, an extensive needs or business requirements audit is necessary to identify, develop, prioritize, and document goals and current practices. It is recommended that any organization consider engaging a third-party or consultant to conduct the audit. While the cost may be prohibitive for organizations with tight budgets, a third-party may be more successful in gathering sensitive opinions and feedback as a third-party, unlike stakeholders, have no personal attachment or stake in the intranet and do not have any political agendas. It is important to gather and understand the needs and requirements of senior management, intranet stakeholders and average users; a representative sampling of user opinions is crucial to gathering an accurate reading on all business needs and requirements. Before undertaking any intranet or portal design or redesign, regardless of the size of the project, a requirements assessment is necessary to identify, develop, prioritize, and document goals and current practices. As mentioned above, each engagement begins with an assessment that concretely identifies and documents the project’s goals and objectives, aligns those objectives with those of the sponsoring department and the enterprise as a whole, as well as documents the needs and requirements of the user audience and stakeholders. Armed with the acquired data and knowledge, a detailed strategic blueprint – including plans, governance, and user experience design -– can be crafted to build a leading-edge intranet, as part of a complete digital workplace. Individual modules in the Assessment Phase may include Stakeholder Engagement, User Research Review, User Survey, User Focus Groups, Benchmarking (sometimes conducted in the Planning Phase) and the delivery of the Key Findings and Recommendations Report.